The terrifying legend of the wendigo finds its origins in Algonquin traditions. It is known as the dangerous spirit of winter with the ability to transform men women and children into a terrifying cannibalistic creature with a heart of ice. It is said that with time, the creature becomes gigantic in size and monstrous in nature with a gaunt, horrifying contenance to look upon. 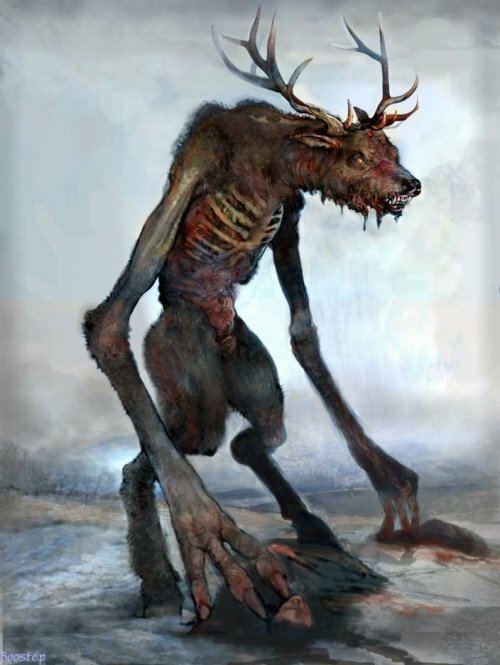 The Algonquins of the North have a long history with the demon known as the wendigo… so much so that one might remark that they retain a certain kind of obsessive fear related to the subject, and are in constant contemplation of the idea that they themselves might be transformed into one of these dreaded creatures. The Algonquin nations represent one of the largest cultural groups in North America. From the eastern seaboard to south Virginia and as far as the prairies in the west, Algonquin identities encompass a plethora of nations including various Cree, Ojibwa, Mi’kmaq, Kickapoo among many more. In the winters it was customary to divide into smaller groups based on family units as scarcity set it and it becomes harder to feed large groups living in the same area. The isolation that came with smaller group organization led to dangerously scarce circumstances for some, and the harsh northern winters would increase that sense of isolation, leading some to near famine scenarios or in some cases real famine, where only spring would break the threat of death with the promise of fresh game and new flora. The wendigo is known by most as a mythic monster that, regardless of its variation or subtle difference in description from region to region, is always absolutely terrifying. Some accounts of the wendigo describe something more physical, but in other cases the wendigo appears in dream sequences that have equally dire consequences for the individual, dreams being a very important part of identity and spirituality amongst many peoples. The variations are dependent on the region and the local nation’s interpretation of the wendigo. "The Wendigo was gaunt to the point of emaciation, its desiccated skin pulled tautly over its bones. With its bones pushing out against its skin, its complexion the ash gray of death, and its eyes pushed back deep into their sockets, the Weendigo looked like a gaunt skeleton recently disinterred from the grave. What lips it had were tattered and bloody [....] Unclean and suffering from suppurations of the flesh, the Weendigo gave off a strange and eerie odor of decay and decomposition, of death and corruption." The story of Mapanin, a Woods Cree member. Mapanin’s story was recorded in a diary kept by trade post keeper Francis Beatton of Trout Lake, Alberta. The horrifying transformation took place in the year 1896. Mapanin was a ordinary Cree native who was in regular contact with his tribesmen as well as the missionaries in the area. It is told by Beatton that he encountered Mapanin after the Cree man arrived in Trout lake in a state of despair, relating to tradesmen that he had had visions of his son appearing to him as a young man. Mapanin had in turn felt a strong desire to consume the body of his own flesh and blood, and that the desire had stayed with him for a time. Beatton was terribly frightened and disturbed by Mapanin’s confession, and decided the man must simply be starving. Why else would one have the desire to consume human flesh, the most grotesque sin a person could commit, reasoned Beatton. He set about making Mapanin a fine meal that would appeal to any man, but Mapanin was strangely silent and unwilling to consume the food prepared for him. Beatton soon left, still greatly concerned for Mapanin’s state of mind as well as for the Cree man’s family who appeared to be the target of his unnatural, monstrous appetite. On his next visit, Beatton recorded how sickly Mapanin appeared, with sallow yellowing skin and sunken cheekbones. He gave the Cree man a dose of castor oil as treatment for his confusing illness which the reverend could not diagnose. Before Beatton left, he heard Mapanin muttering that his heart was turning to ice. After this visit, Mapanin was relentless in his belief that he was turning into a cannibal. The disturbed individual became increasingly fervent in his behaviors and eventually he was put to death by his fellow tribesmen after a period of three years. Beatton’s account illuminates an important part of the legend, the slow physical transformation that accompanies a spiritual possession. The Cree man exclaimed to Nelson: “Had I unfortunately eaten of this then had I become a cannibal in addition to all my other misfortunes.” (Smallman) Nelson recorded multiple instances in which he encountered wendigo-like characteristics in a man, which was often characterized by a frenzied-state and then a manic depressive dive, the victim is described as rocking between the two states and also between states of lucid rationalism. Nelson suggested that this might actually be a widespread preoccupation amongst the algonquin peoples and beyond… an obsession of sorts: "They have such a dread and horror of this that it is constantly in their mind.” (Smallman). Needless to say, the Europeans were baffled to a certain extent by the amount of importance dreams played in Algonquin culture, and even more baffled by the idea of the wendigo as a spirit that can appear to a man in a dream and have consequences in real life. However, the 17th-century European settlers did believe in evil supernatural spirits just as strongly as their First Nations contemporaries. In fact, Father Le Jeune’s report predates the Salem Witch Trials by nearly 60 years. Missionaries in what became Canada continued to report legends of the wendigo until well into the 20th century. People would continue to spot strange things that some believe could be linked to the wendigo. Early western settlers often reported seeing a “banshee-like” creature, they feared its appearance because they believed this meant that there was to be a death in their community. To Europeans, the wendigo was a fatal harbinger. Salem Witch Trials Depiction ; It would seem that the 1700’s were characterized by paranoia in multiple forms, whether of witches or wendigos each culture had its own demons. Robert Brightman comments on the antiquity of the belief in the wendigo amongst various algonquin nations, arguing that the phenomenon was antecent to European arrival and therefore not caused by European contact/ecological influences of the fur trade on scarcity of food sources, etc. The term Montagnais refers a member of an American Indian people living in a vast area of Canada from north of the Gulf of St. Lawrence to the southern shores of Hudson Bay. Brightman goes against much of the academic literature of the past, which has argued that the “Wendigo Psychosis” was a product of ecological consequences stemming from contact with European colonists. Arguments of this sort rely on the idea that the fur trade caused an extreme stressor on the indigenous populations who relied on such animals for sources of food over the winter. The ecological depletion of fox, beaver, bear and more is the determining factor on the transition into a cultural paranoia of the Algonquin nations resulting in a spike of Wendigo Psychosis. The nature of the argument is decidedly Euro-centric and discludes the possibility that the mythos and history of the Algonquins stretches back hundreds if not thousands of years. Many stories of the wendigo depict self-described monsters who claim to have cannibalistic urges. The story of Wiskahoo, a cree native and a self described wendigo is one such case. Wiskahoo resided in the Manitoba region and was familiar with the brutal reality of famine, surviving a few deadly encounters with scarcity in his life, especially in the cold, long northern winters. Wiskahoo and his fellow clansmen regularly encountered frontier tradesmen and various explorers travelling through the area. One such individual went by the name of David Thompson, who engaged with the Cree peoples frequently in trade. It was customary to give the natives a drink when they would see each other, and in a most peculiar fashion Wiskahoo would take his drink of grog and shortly after be seen in a most melancholy and in a contemplative mood, murmuring under his breath an ominous Cree phrase: Nee-wee-to-go, or loosely translated, “I must be a man eater” . The phonetics of the phrase closely resemble niwihtik6win 'I am a windigo'. Eventually wiskahoo was put to death by his fellow tribesmen after his melancholic moods increased in frequency. Henry described how the Ojibwa man and a few others had joined his party. The nation had been experiencing famine as of late and the afflicted man had seen the worst that hunger can do to a man… emaciating him and transforming him into a ravaging beast. Sitting around the campfire one brutally cold evening, the natives explained to Henry and his fellow traders how once a man has consumed human flesh he will eat no other… not believing at first, Henry watched as the man refused all food prepared for him, but all the while gazed longingly with sunken, hungry eyes after the children that lay just outside of his grasp, exclaiming all the while how healthy and fat they looked. Henry vividly described how “gaunt and pale from a lack of food” the man appeared, skeletal like. Henry also entertained the idea that perhaps the afflicted man could have been innocently commenting on the health of the children, but the natives he was party to considered the threat real and put the man to death. The real catch was that the man outright refused to eat regular food that was available and prepared for him, instead coveting that which is the ultimate taboo: human flesh. These two cases are interesting in the depiction of justice served in indigenous terms. The fellow tribesmen felt justified in killing Wiskahoo because of his repeated behaviors and declarations of being a man-eater. However, encroaching settler populations did not sympathize with these ways of dealing with wendigos, and there are several examples of meddling by colonial goverment into the dealings of the Algonquins. For this case, we had some help from the boys at Graveyard Tales Podcast, who dug up some sickening details about this case: they relate how Swift and his family had been isolated for some time that winter, and when spring arrived and Swift was seen back at the trading post without his family, he dodged all questions about their whereabouts. Eventually, concerned members of the community urged the northwest mounted police to search Swift’s property. What they found horrified them. The property was littered with bones, sucked clean of the marrow. Upon inspection these proved to be human, swift’s wife and brother in particular. Swift never denied the incident, simply saying that a wendigo committed these atrocities. He went on to describe how the wendigo forced him to kill and eat his family, even forcing him to watch as his infant son was strung up by the wendigo in a tree and proceeded to yank on the young boys feet until he died of suffocation. Many of Swift’s tribe members came to his defence, believing the story that a wendigo had come and committed the crimes or had forced swift to commit them himself. The judge was less inclined to believe the legend and sentenced swift to death. Another intriguing case which hails from October of 1907 (a popular year for the Wendigo,) which involved a Cree man named Jack Fiddler, who had claimed to have killed 14 of these monsters during his lifetime. The story garnered international attention when the then 87 year-old men was sentenced to life imprisonment for the murder of a Cree woman, whom he claimed was on the verge of transforming completely into a ravenous member of the Wendigo clan. Neither Fiddler, nor his son Joseph, hesitated in pleading guilty to the crime, but both insisted that their decisive action averted what could have quickly become a profound tragedy for the other members of their tribe. What is the Wendigo? A Creature? A Spirit? A Psychosis? Some have compared the Wendigo to the Skinwalker phenomenon, others still consider it a relative to Sasquatch. Many believe the wendigo to be a state of mind, a delusion brought on by a perennial state of scarcity, while others conform to the idea of the wendigo as the ultimate cautionary tale against the sin of consuming the flesh of one’s brethren. Theories abound, and we would love to get your take on the terrifying Wendigo. Email us at Intotheportalmailbox@gmail.com or comment below.